Staff at the Cornish Seal Sanctuary have condemned the Canadian Government for allowing nearly a million seals to be killed over the next three years in the largest hunt of marine mammals...including 350,000 seal pups. The Sanctuary is urging members of the public to get on line and add your name to the petition, being sent to the Canadian government, at the IFAW web site at www.ifaw.org and at Harpseals.org. "It has been estimated that up to 42% of seals are skinned alive, a truly barbaric practice," said Tamara Cooper, The Curator, at the Cornish Seal Sanctuary. "These figures suggest that a lot of the sealing regulations, put in place by the Government to help regulate the hunt, are ignored by hunters who kill seals without supervision on the ice." "The vessel-based commercial hunt for whitecoat pups stopped in the late 1980´s, but hundreds of thousands of seals have been killed each year since then, with quotas increasing steadily in the late 1990´s," said Tamara. "One study also suggests that the Canadian Government significantly underestimates the total number of seals that die each year, because many animals are lost at sea." "Not only are the seals under threat from man, but environmental factors haven´t been accounted for by the Canadian government." "Scientists have recorded large areas of ice disappearing due to global warming. 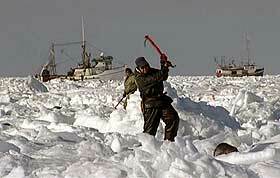 Harp seals are ice-breeding so this poses a serious threat to future populations," added Tamara. "This is a wildlife tragedy on an epic scale that is repeated year after year. What´s worse is that millions of people in Canada and around the world have no idea that a large-scale hunt continues to brutally claim the lives of so many animals." "This is why we are supporting the petition. Hopefully it will help raise awareness and help to convince the Canadian government that public opinion in Canada and internationally is strongly opposed to their policy on sealing." The Cornish Seal Sanctuary operates a busy seal hospital rescuing, rehabilitating and releasing seals around the Cornish coast. "We all feel very strongly about this it goes against everything we stand for," said Tamara. Recent polls have consistently shown public opinion in Canada to be against the cull, with many countries choosing to boycott Canadian Products. Issued by the Cornish Seal Sanctuary, for further details contact them. On line petition at the IFAW petition.